3 Big Shop Lane, Ridgefield. I’ve known Noreen Mola for probably 25 years, and until I saw her on stage at Luc’s in Ridgefield, I’d never heard her sing a note. I didn’t know she could sing. But there she was on stage on a recent Wednesday night, backed by the amazing gypsy guitarist Larry Urbon. And she was a revelation, whether singing Great American Songbook standards or French chanson. Not 10 feet away, nodding and swaying to the music, was Rolling Stones guitarist (and occasional Weston resident) Keith Richards. Mola, who has a long history as an artist, says her music career came about by accident. She met Urbon at Luc’s when he was backing another jazz singer, Cynthia McCorkindale, who also has a way with French songs. Since 1996, Urbon has headed his own world jazz project, Café Musette (French for “café music”). Currently, there are several versions of the group, ranging from Urbon playing solo with recorded backing tracks to an instrumental quartet. Mola and Urbon bonded on animal welfare before they started playing music together. Many of Fairfield County’s rescued cats and dogs have Mola to thank, and Urbon has eight rescued cats and a rabbit at his home in Fairfield. 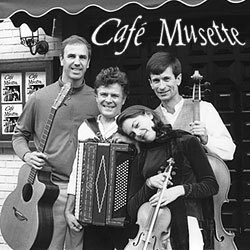 Café Musette was started with folk, Celtic and bluegrass influences. It was reinvented in 2001 as a jazzier, female vocal-oriented ensemble. The group had two singers before Mola. The first was a Belgian-born Jacques Brel specialist, and McCorkindale teamed up with Urbon from 2002 to 2003. And, by George, they got it. Wherever her talent has been all these years, Mola’s voice is rich and warm, with a nice dark lower register. She swings, in whatever language. Café Musette has recorded one CD, and a second with Mola’s vocals front and center is in the works. Mola’s singing is complemented well by Urbon. Gypsy jazz is some of the world’s hardest music to play, and Urbon (whose day job is teaching in a private school) plays it extremely well, cleanly articulating even the trickiest line. On a typical gig, Mola can help you forget other versions of “La Vie en Rose,” “Almost Like Being in Love,” “Mr. Sandman,” “Under Paris Skies” and “Tea for Two.” The repertoire extends to French classics, Spanish and Portuguese songs, and even some in Django’s Roma-gypsy language, and Café Musette’s influences include some people you may want to seek out: Charles Trenet, Serge Gainsbourg, Paolo Conte, Ennio Morricone, Amália Rodrigues, European film soundtracks, and England’s Puppini Sisters. 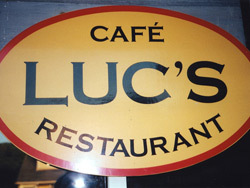 The French songs are certainly appropriate at their home base of Luc’s, where the gourmet Gallic fare is served up by Hervé Aussavis, who comes from the town that borders Samois-sur-Seine, where Django Reinhardt lived for the latter years of his life. GEORGETOWN – I’ve never denied my escapist tendencies. More than once I’ve admitted my fascination with bad movies, worse sitcoms and the occasional venture into the world of the evil infomercial. Yikes! My lack of control even caused me to banish my poor television to the hall closet for nearly a year. But in a brave maneuver, I opened the lines of communication and allowed the TV to come out of the closet. I seem to have overcome my obsession and have limited myself to late-night rendezvous with Edith and Archie, Lucy and Desi and the girl who can turn the world on with her smile. I’m clean and sober now – I can hit the power button on the remote any time I want. Even my long-term love affairs with the likes of Bob Vila and Norm Abrams are relatively under control. After all, why sit around and watch when you can hop in the truck, drive to Home Depot and “do it yourself” with the best of ’em? So yeah. I did spend a certain portion of my weekend poking around the Do It Yourself Warehouse. I even pulled out my Black & Decker power tool collection and put them to good use. Let me just say that all that drilling and screwing works up a mighty powerful thirst. And not the kind of thirst easily quenched at the local martini bar or trendy little club. Even the finest wine bar or pub on the corner somehow just isn’t equipped to do the trick. No siree, Bob. This is the kind of thirst that only a good old-fashioned saloon can remedy. And so after all the power tools were safely and snugly put away, I revved up the truck and headed north up Route 7 to Georgetown. Main Street may not, at first glance, look all that much like Dodge City, but walking through the swinging doors of the Georgetown Saloon (8 Main St., Georgetown) is like walking out of the movie set of Fairfield County and into a quaint corner of the real world. I’ve said it before and – oops! – here I go again. With all the hip hotspots cropping up all over the place, cool and funky and flawlessly architectured, there’s one important component to a “cool hangout” that, no matter how hard they try, simply can’t be built in. It’s that hard-to-describe feeling you get when you walk in to a place like the Georgetown Saloon. Call it a vibe, call it atmosphere or ambience, but it feels warm and welcoming, friendly and beckoning – with no pretense. Maybe it’s the rustic decor, or the wood-framed pictures of patrons lining the walls. Or maybe it’s just the genuine smile you get from the bartender when she asks, “What can I get for you?” All I know is that I felt perfectly at home as I sat down with my beer and the paper and waited to meet up with a friend. Unquenchable thirst aside, there was another reason I chose the Georgetown Saloon for my Sunday night excursion. The music. I know Monday morning comes early and Sunday isn’t always ideal for a night on the town, and the folks at the Saloon understand that, too, because they give you the best of both worlds by scheduling earlier entertainment. So if you find you’ve got a hankering to catch a band on a Sunday night and yet the grownup in you keeps reminding you that the alarm clock will be sounding at some ungodly hour Monday morning, you can simply point out that the perfect compromise would be a night out in Georgetown where the music starts and 6 p.m. and runs to the late, great hour of 8:30. You can be home in bed buried underneath the covers at a reasonable hour. Your inner adult should have no problem with that. Particularly if the band in question is Café Musette. It’s no secret that I’m out and about most nights of the week – it’s my job after all – and I have to say, Café Musette is one of the most interesting combos I’ve heard in a long time. If that intangible thing that hits you when you walk into the Georgetown Saloon is hard to describe, so is Café Musette. I don’t want to dissect the components of the music and thereby commit a serious injustice. So let me just say that as I sat there engaged in that wonderful kind of conversation you can only have with a friend you haven’t seen in ages, I felt myself floating away to an outdoor café in... I don’t know, Venice maybe? As if the guitar, accordion and violin were weaving some sort of magic carpet and taking me away before I even realized I was gone. Moments later, the Italian café melted into a smoky, blues-tinged jazz club somewhere south of here. “Uh... would that be with an ‘e’ and a ‘d’?” I asked. Ed bounced his head in a singular nod, raised his glass in toast and turned back to the bar. My friend and I looked at each other. “Only you,” she laughed. Yeah, there’s an inexplicable something about the Georgetown Saloon. Anywhere else I might have thought that exchange a strange one, but how can anything be strange in an honest-to-goodness saloon nestled in the middle of Fairfield County where musical magic carpets whisk you around the world and gently set you back down so you can finish your beer and make it safely home at a reasonable hour? Visit the Fairfield County Weekly online.